The Horror Digest: Black Christmas: Here's a Question. Was It Ever Possible To Call The House You are In's Phone? I Doubt It. 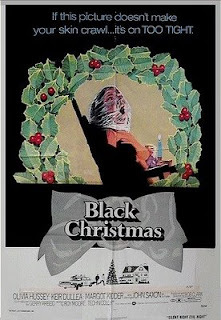 Black Christmas is great. Looking forward to watching it again as it approaches Christmas. Luckily this year I get to see it on the big screen. It's ok to be envious. Great post on it. Glad you liked it. Recorded this movie on my DVR on Christmas Eve 2009, then watched it early this year. Fantastic example of what was truly great about the horror of that era. Atmosphere, not blood and guts, is the key to a suspenseful fright flick. Although less iconic than Carpenter's "Halloween", I actually found this to be a scarier film.